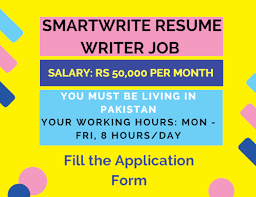 SmartWrite Resume Writer Job: Work from home, Salary Rs.50,000 per month. Your working hour from Mon to Fri, 8 hours per day. They will give two months paid maternity / paternity leave. Ten days paid leave per year. Your residence must be in Pakistan. You must have your own laptop computer. You must live in the big city. This job is shared by NUST & COMSATS. (Screenshots are provided below). The candidates should be graduated from the top university in Pakistan. The candidates can have the previous writing, editing or customer service experience. They must have great grades in English classes. The candidates should apply now to fill the Google application forms. Interacting with American clients on daily basis and you should have an easy-to-understand accent and complete knowledge of American culture and mannerisms. Give the answers of emails professionally and engage with clients. You need to study resources and learn quickly. In 2017, we received over 400 applications and majority of the applications were rejected automatically as they were incomplete or have the grammatical mistakes. Please read and give the answers of each question carefully, as we are highly selective. We choose such talented and capable persons to work with and will reject all applications, which will be filled carelessly. You must be residing in Pakistan. You must have your own laptop computer. You must live in a big city. Your internet connection must be minimum 4 MBPS. You must be able to take feedback constructively. You must commit to work with us for one year. We only accept full-time workers; the people working for any other company or studying at university, even part-time, is major violation of our contract. Graduated from a top university in Pakistan. Previous writing, editing, or customer service experience. Great grades in English classes. If we like your application, we will tell you to fill out supplemental written interview form to test your mastery of English language. We will also conduct the telephonic interview and go over whatever questions you have. Finally, we will begin your training, which will take seven weeks. If you are interested, please fill out this written interview form, which is designed to test your mastery of English language. Online Application Form is given below.